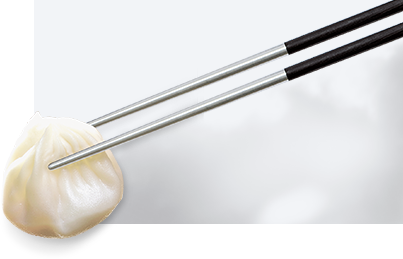 Whenever the name Din Tai Fung is mentioned, more often than not the first thing that comes to mind is the perfect xiaolongbao: fresh and juicy, thin and delicate skin, and complete with 18 folds. Yet how did Din Tai Fung come by its reputation? Where did the name Din Tai Fung come from, and how was the company started? This is the story of Din Tai Fung. Din Tai Fung's founder, Mr. Yang Bing-Yi, was born in 1927 in China's Shanxi province. 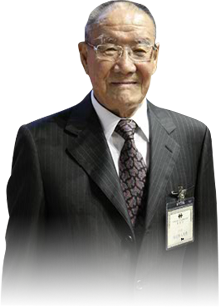 In the summer of 1948, while China was engulfed in civil war, the 21-year old made the decision to leave and make his way in the world. He boarded the ship Hualien in Shanghai and traveled to Taiwan to meet up with his aunt and uncle who were living there. With their help, he was able to secure his first job in Taiwan as a deliveryman for a cooking oil retailer called Heng Tai Fung. Little more than two years later, he already had a reputation for being honest and hardworking, and the owner of Heng Tai Fung let him take charge of bookkeeping and managing the shop's inventory. At the age of 28, Bing-Yi Yang married Lai Pen-Mei, one of his coworkers at Heng Tai Fung, and they both continued to work at Heng Tai Fung for the next three to four years. However, due to a failed investment, Heng Tai Fung suffered a setback from which it could not recover, and the day came when owner was forced to close the business. At this point in time Yang Bing-Yi was already 31, and after leaving Heng Tai Fung he and his wife decided to start their own business. But what to call their new business? In the end, they decided on the name Din Tai Fung, a combination of Din Mei Oils, the name of their supplier, and Heng Tai Fung, the shop where Yang Bing-Yi got his first job. In doing so they could also express their gratitude to the owner of Heng Tai Fung. The shop opened in 1958, a time when even obtaining a telephone number was difficult. The number 2321-8927 that is in use today at the original location in Xinyi is still the same one that Yang Bing-Yi applied for back in 1958. Through a government contact that he knew from his hometown in Shanxi, he was able to obtain a telephone and apply for a number. 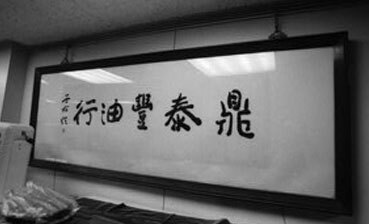 He even managed to have a sign made for his shop by the famous calligrapher Yu You-Ren. The sign, which reads: Din Tai Fung Oil Retail, still hangs near the front entrance to the original Din Tai Fung in Xinyi, as it has for more than 40 years. Due to Yang Bing-Yi's good reputation and connections that he had made while at Heng Tai Fung, the oil business at Din Tai Fung got off to a good start. After putting together some savings, he and his wife bought a storefront and moved to a new location. The Xinyi Branch still stands at that same location to this day. However, in the early 1970s tinned cooking oil became widely available, and this changed the way that consumers bought oil. Din Tai Fung's oil sales took a big hit, and business continued to go downhill. Yang Bing-Yi and his wife both knew that they couldn't simply go on selling oil as they had before. While they thought that they had reached the end of the line, this was actually just the beginning of what would be a major turning point for Din Tai Fung. At the advice of his friend Mr. Tang, the owner of the Fuxing Yuan restaurant, Yang Bing-Yi and his wife dedicated half of their shopfront to selling xiaolongbao instead of cooking oil. Din Tai Fung's xiaolongbao quickly became very popular, and customers began to spread the word far and wide. Soon business was booming, and it was then that Din Tai Fung closed the oil business and officially became a restaurant specializing in xiaolongbao and other Chinese dishes. This was the humble beginning of what would go on to become a celebrated international brand. Some of the most important aspects of restaurant service are friendliness and flexibility. The outstanding service that diners receive at Din Tai Fung comes from the heart. Staff at Din Tai Fung seeks to put the customer's needs first, providing proactive service in which even the tiniest detail embodies Din Tai Fung's service philosophy and brand values. Since taking over management of Din Tai Fung from his father, the restaurant's founder Yang Bingyi, Yang Chihua has worked to transform a single, small restaurant into a world-class, international chain of gourmet restaurants. Rather than focusing solely on sales performance, Din Tai Fung's main aim is to provide customers with the best possible service, strengthen brand visibility, and achieve sustainable growth. Careful selection of ingredients; attention to detail in food preparation; fine-tuning of cooking techniques; the best possible tableside service – Din Tai Fung takes the same painstaking care at each step in the process of bringing outstanding gourmet food to customers, with rigorous quality assurance at every level. The top-class food that we serve is the embodiment of this service philosophy. Our insistence on quality is part of our responsibility to our customers. Each and every moment is an opportunity to show that we care, and each and every detail is a small part of the foundation that the Din Tai Fung brand is built upon. It is this attention to detail and commitment to our craft that guarantees a first-class dining experience at Din Tai Fung.